Additionally, the book provides examples of pure folly and some lessons on how to make fewer dumb mistakes than other people. And then how to fix mistakes faster, should you make them. The major lesson is “ignorance removal” and the notion that decision-making is not about making brilliant decision, but avoiding terrible ones. 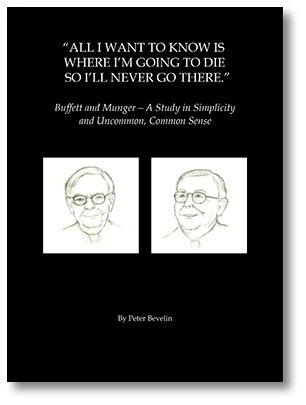 This is not a book for those who like complexities or advanced math – rather it’s for those who love efficiency, simplicity and common sense or judgment – hallmarks of Buffett and Munger. Like Einstein, both have a remarkable ability to eliminate folly and superficiality and get directly to the heart of things. As with Poor Charlie’s Almanack, Seeking Wisdom, A Few Lessons and The Most Important Thing, net proceeds from sales of All I Want To Know Is Where I'm Going To Die So I'll Never Go There will be donated to charitable, non-profit organizations.